Only a few people know, but I am really a sucker for skirts. I feel feminine and comfortable wearing skirts and I love how it allows me to experiment with many looks and styles. I'm no fashionista but I know how to dress up well when the need arises. My latest skirt acquisition came from the SM Department Store. The brand is CHILL and I got it for just P200! 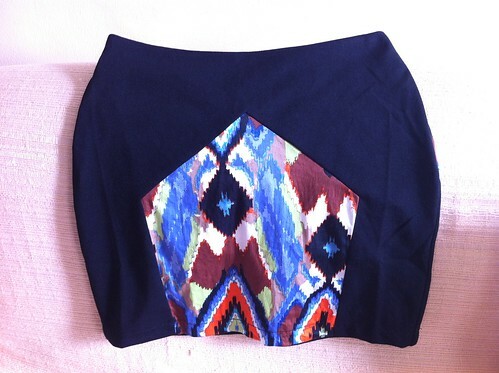 It's a tight-fitting mini-skirt with a cool and strategically-designed Aztec prints in front and at the back. When I saw it hanging in one of the racks, I just had to have it! And I got ecstatic when I saw it had a yellow tag which meant it was on sale. Haha. this skirt is pure love! "CHILL is RMI’s girls teen’s wear line that caters to the fashionista who is always looking for the newest trends. The CHILL girl wears only reasonably priced outfits that will make her look good, feel good and stand out from a crowd. She is FUN, FRESH and ORIGINAL. Every girl looks up to her for her personality and style."